The Timurid Empire (Persian: تیموریان‎, Timuriyān), self-designated as Gurkani (Persian: گورکانیان‎, Gurkāniyān), was a Persianate Turco-Mongol empire comprising modern-day Uzbekistan, Iran, the Caucasus, Mesopotamia, Afghanistan, much of Central Asia, as well as parts of contemporary India, Pakistan, Syria and Turkey. The empire was founded by Timur (also known as Tamerlane), a warlord of Turco-Mongol lineage, who established the empire between 1370 and his death in 1405. He envisioned himself as the great restorer of the Mongol Empire of Genghis Khan and, while not descended from Genghis, regarded himself as Genghis's heir and associated much with the Borjigin. The ruling Timurid dynasty, or Timurids, lost most of Persia to the Aq Qoyunlu confederation in 1467, but members of the dynasty continued to rule smaller states, sometimes known as Timurid emirates, in Central Asia and parts of India. In the 16th century, Babur, a Timurid prince from Ferghana (modern Uzbekistan), invaded Kabulistan (modern Afghanistan) and established a small kingdom there, and from there 20 years later he invaded India to establish the Mughal Empire. Timur conquered large parts of Central Asia, primarily Transoxiana and Khorasan, from 1363 onwards with various alliances (Samarkand in 1366, and Balkh in 1369), and was recognized as ruler over them in 1370. Acting officially in the name of Suurgatmish, the Chagatai khan, he subjugated Transoxania and Khwarazm in the years that followed. Already in the 1360s he had gained control of the western Chagatai Khanate and while as emir he was nominally subordinate to the khan, in reality it was now Timur that picked the khans who became mere puppet rulers. The western Chagatai khans were continually dominated by Timurid princes in the 15th and 16th centuries and their figurehead importance was eventually reduced into total insignificance. Timur began a campaign westwards in 1380, invading the various successor states of the Ilkhanate. By 1389, he had removed the Kartids from Herat and advanced into mainland Persia where he enjoyed many successes. This included the capture of Isfahan in 1387, the removal of the Muzaffarids from Shiraz in 1393, and the expulsion of the Jalayirids from Baghdad. In 1394–95, he triumphed over the Golden Horde, following his successful campaign in Georgia, after which he enforced his sovereignty in the Caucasus. Tokhtamysh, the khan of the Golden Horde, was a major rival to Timur in the region. He also subjugated Multan and Dipalpur in modern-day Pakistan in 1398. Timur gave the north Indian territories to a non-family member, Khizr Khan, whose Sayyid dynasty replaced the defeated Tughlaq dynasty of the Sultanate of Delhi. Delhi became a vassal of the Timurids but obtained independence in the years following the death of Timur. [dubious – discuss] In 1400–1401 he conquered Aleppo, Damascus and eastern Anatolia, in 1401 he destroyed Baghdad and in 1402 defeated the Ottomans in the Battle of Ankara. This made Timur the most preeminent Muslim ruler of the time, as the Ottoman Empire plunged into civil war. Meanwhile, he transformed Samarkand into a major capital and seat of his realm. Timur appointed his sons and grandsons to the main governorships of the different parts of his empire, and outsiders to some others. After his death in 1405, the family quickly fell into disputes and civil wars, and many of the governorships became effectively independent. However, Timurid rulers continued to dominate Persia, Mesopotamia, Armenia, large parts of Azerbaijan, Afghanistan, Pakistan, minor parts of India, and much of Central Asia, though the Anatolian and Caucasian territories were lost by the 1430s. Due to the fact that the Persian cities were desolated by wars, the seat of Persian culture was now in Samarkand and Herat, cities that became the center of the Timurid renaissance. The cost of Timur's conquests amount to the deaths of possibly 17 million people. Shahrukh Mirza, fourth ruler of the Timurids, dealt with Kara Koyunlu, who aimed to expand into Iran. But, Jahan Shah (bey of the Kara Koyunlu) drove the Timurids to eastern Iran after 1447 and also briefly occupied Herat in 1458. After the death of Jahan Shah, Uzun Hasan, bey of the Ak Koyunlu, conquered the holdings of the Kara Koyunlu in Iran between 1469 and 1471. The power of Timurids declined rapidly during the second half of the 15th century, largely due to the Timurid tradition of partitioning the empire and by 1500, the divided and wartorn Timurid Empire had lost control of most of its territory, and in the following years was effectively pushed back on all fronts. Persia, the Caucasus, Mesopotamia, and Eastern Anatolia fell quickly to the Shiite Safavid dynasty, secured by Shah Ismail I in the following decade. Much of the Central Asian lands was overrun by the Uzbeks of Muhammad Shaybani who conquered the key cities of Samarkand and Herat in 1505 and 1507, and who founded the Khanate of Bukhara. From Kabul, the Mughal Empire was established in 1526 by Babur, a descendant of Timur through his father and possibly a descendant of Genghis Khan through his mother. The dynasty he established is commonly known as the Mughal dynasty though it was directly inherited from the Timurids. By the 17th century, the Mughal Empire ruled most of India but eventually declined during the following century. The Timurid dynasty finally came to an end as the remaining nominal rule of the Mughals was abolished by the British Empire following the 1857 rebellion. Although the Timurids hailed from the Barlas tribe, which was of Turkicized Mongol origin, they had embraced Persian culture, converted to Islam, and resided in Turkestan and Khorasan. Thus, the Timurid era had a dual character, reflecting both its Turco-Mongol origins and the Persian literary, artistic, and courtly high culture of the dynasty. During the Timurid era, Central Asian society was bifurcated, with the responsibilities of government and rule divided into military and civilian spheres along ethnic lines. At least in the early stages, the military was almost exclusively Turko-Mongolian, while the civilian and administrative element was almost exclusively Persian. The spoken language shared by all the Turko-Mongolians throughout the area was Chaghatay. The political organization hearkened back to the steppe-nomadic system of patronage introduced by Genghis Khan. The major language of the period, however, was Persian, the native language of the Tājīk (Persian) component of society and the language of learning acquired by all literate and/or urban people. Timur was already steeped in Persian culture and in most of the territories he incorporated, Persian was the primary language of administration and literary culture. Thus the language of the settled "diwan" was Persian, and its scribes had to be thoroughly adept in Persian culture, whatever their ethnic origin. Persian became the official state language of the Timurid Empire and served as the language of administration, history, belles lettres, and poetry. The Chaghatay language was the native and "home language" of the Timurid family, while Arabic served as the language par excellence of science, philosophy, theology and the religious sciences. It can be viewed as a specific reaction in the wake of Timur's death in 807/1405 to the new cultural demands facing Shahhrokh and his sons, a Turkic military elite no longer deriving their power and influence solely from a charismatic steppe leader with a carefully cultivated linkage to Mongol aristocracy. Now centered in Khorasan, the ruling house regarded the increased assimilation and patronage of Persian culture as an integral component of efforts to secure the legitimacy and authority of the dynasty within the context of the Islamic Iranian monarchical tradition, and the Baysanghur Shahnameh, as much a precious object as it is a manuscript to be read, powerfully symbolizes the Timurid conception of their own place in that tradition. A valuable documentary source for Timurid decorative arts that have all but disappeared for the period, the manuscript still awaits a comprehensive monographic study. The Timurids also played a very important role in the history of Turkic literature. Based on the established Persian literary tradition, a national Turkic literature was developed in the Chagatai language. 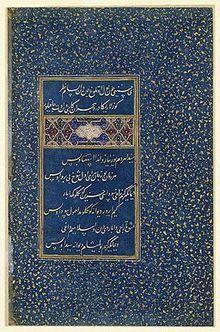 Chagatai poets such as Mīr Alī Sher Nawā'ī, Sultan Husayn Bāyqarā, and Zāher ud-Dīn Bābur encouraged other Turkic-speaking poets to write in their own vernacular in addition to Arabic and Persian. The Bāburnāma, the autobiography of Bābur (although being highly Persianized in its sentence structure, morphology, and vocabulary), as well as Mīr Alī Sher Nawā'ī's Chagatai poetry are among the best-known Turkic literary works and have influenced many others. The golden age of Persian painting began during the reign of the Timurids. During this period – and analogous to the developments in Safavid Persia – Chinese art and artists had a significant influence on Persian art. Timurid artists refined the Persian art of the book, which combines paper, calligraphy, illumination, illustration and binding in a brilliant and colourful whole. The Mongol ethnicity of the Chaghatayid and Timurid Khans was the source of the stylistic depiction of Persian art during the Middle Ages. These same Mongols intermarried with the Persians and Turks of Central Asia, even adopting their religion and languages. Yet their simple control of the world at that time, particularly in the 13th–15th centuries, reflected itself in the idealised appearance of Persians as Mongols. Though the ethnic make-up gradually blended into the Iranian and Mesopotamian local populations, the Mongol stylism continued well after and crossed into Asia Minor and even North Africa. Timurid architecture drew on and developed many Seljuq traditions. Turquoise and blue tiles forming intricate linear and geometric patterns decorated the facades of buildings. Sometimes the interior was decorated similarly, with painting and stucco relief further enriching the effect. Timurid architecture is the pinnacle of Islamic art in Central Asia. Spectacular and stately edifices erected by Timur and his successors in Samarkand and Herat helped to disseminate the influence of the Ilkhanid school of art in India, thus giving rise to the celebrated Mughal (or Mongol) school of architecture. Timurid architecture started with the sanctuary of Ahmed Yasawi in present-day Kazakhstan and culminated in Timur's mausoleum Gur-e Amir in Samarkand. Timur's Gur-I Mir, the 14th-century mausoleum of the conqueror is covered with "turquoise Persian tiles". Nearby, in the center of the ancient town, a "Persian style madrassa" (religious school) and a "Persian style mosque" by Ulugh Beg is observed. The mausoleum of Timurid princes, with their turquoise and blue-tiled domes remain among the most refined and exquisite Persian architecture. Axial symmetry is a characteristic of all major Timurid structures, notably the Shāh-e Zenda in Samarkand, the Musallah complex in Herat, and the mosque of Gowhar Shād in Mashhad. Double domes of various shapes abound, and the outsides are perfused with brilliant colors. Timur's dominance of the region strengthened the influence of his capital and Persian architecture upon India. Akhangan's tomb, where Gowharšād's sister Gowhartāj is buried. The architecture is a fine example of the Timurid era in Persia. Façade of Bibi Khanym Mosque. ^ Subtelny, Maria E. (2007). Timurids in Transition: Turko-Persian Politics and Acculturation in Medieval Iran. Leiden: Brill. p. 260. ISBN 978-9004160316. Manz, Beatrice Forbes (1999). The Rise and Rule of Tamerlane. Cambridge University Press, p.109. ISBN 0-521-63384-2. Limited preview at Google Books. p.109. "In almost all the territories which Temür incorporated into his realm Persian was the primary language of administration and literary culture. Thus the language of the settled 'divan' was Persian." B.F. Manz, W.M. Thackston, D.J. Roxburgh, L. Golombek, L. Komaroff, R.E. Darley-Doran. "Timurids" Encyclopaedia of Islam Brill Publishers 2007; "During the Timurid period, three languages, Persian, Turkish, and Arabic were in use. The major language of the period was Persian, the native language of the Tajik (Persian) component of society and the language of learning acquired by all literate and/or urban Turks. Persian served as the language of administration, history, belles lettres, and poetry." Robert Devereux (ed.) "Muhakamat Al-Lughatain (Judgment of Two Languages)" Mir 'Ali Shir Nawāi; Leiden, E.J. Brill 1966: "Nawa'i also employs the curious argument that most Turks also spoke Persian but only a few Persians ever achieved fluency in Turkic. It is difficult to understand why he was impressed by this phenomenon, since the most obvious explanation is that Turks found it necessary, or at least advisable, to learn Persian – it was, after all, the official state language – while Persians saw no reason to bother learning Turkic which was, in their eyes, merely the uncivilized tongue of uncivilized nomadic tribesmen. David J. Roxburgh. The Persian Album, 1400–1600: From Dispersal to Collection. Yale University Press, 2005. pg 130: "Persian literature, especially poetry, occupied a central in the process of assimilation of Timurid elite to the Perso-Islamicate courtly culture, and so it is not surprising to find Baysanghur commissioned a new edition of Firdawsi's Shanama." ^ Rein Taagepera (September 1997). "Expansion and Contraction Patterns of Large Polities: Context for Russia". International Studies Quarterly. 41 (3). p. 500. doi:10.1111/0020-8833.00053. JSTOR 2600793. ^ Subtelny, Maria (2007). Timurids in Transition: Turko-Persian Politics and Acculturation in Medieval Iran. BRILL. pp. 40–41. ISBN 978-9004160316. Nevertheless, in the complex process of transition, members of the Timurid dynasty and their Turko-Mongolian supporters became acculturated by the surrounding Persianate millieu adopting Persian cultural models and tastes and acting as patrons of Persian culture, painting, architecture and music. [...] The last members of the dynasty, notably Sultan-Abu Sa'id and Sultan-Husain, in fact came to be regarded as ideal Perso-Islamic rulers who develoted as much attention to agricultural development as they did to fostering Persianate court culture. ^ a b c d "Timurids". The Columbia Encyclopedia (Sixth ed.). New York City: Columbia University. Archived from the original on 2006-12-05. Retrieved 2006-11-08. ^ "Selected Death Tolls: Timur Lenk (1369–1405)". Necrometrics.com. Retrieved 2013-02-11. ^ M. S. Asimov and C. E. Bosworth, History of Civilizations of Central Asia, UNESCO Regional Office, 1998, ISBN 92-3-103467-7, p. 320: "One of his followers was ... Timur of the Barlas tribe. This Mongol tribe had settled ... in the valley of Kashka Darya, intermingling with the Turkish population, adopting their religion (Islam) and gradually giving up its own nomadic ways, like a number of other Mongol tribes in Transoxania ..."
^ a b c B. Spuler, "Central Asia in the Mongol and Timurid periods", in Encyclopædia Iranica. "Like his father, Olōğ Beg was entirely integrated into the Persian Islamic cultural circles, and during his reign Persian predominated as the language of high culture, a status that it retained in the region of Samarqand until the Russian revolution 1917 ... Ḥoseyn Bāyqarā encouraged the development of Persian literature and literary talent in every way possible ..."
^ a b Mir 'Ali Shir Nawāi (1966). Muhakamat Al-Lughatain (Judgment of Two Languages). Robert Devereux (ed.). Leiden: E.J. Brill. OCLC 3615905. LCC PL55.J31 A43. Any linguist of today who reads the essay will inevitably conclude that Nawa'i argued his case poorly, for his principal argument is that the Turkic lexicon contained many words for which the Persian had no exact equivalents and that Persian-speakers had therefore to use the Turkic words. This is a weak reed on which to lean, for it is a rare language indeed that contains no loan words. In any case, the beauty of a language and its merits as a literary medium depend less on size of vocabulary and purity of etymology that on the euphony, expressiveness and malleability of those words its lexicon does include. Moreover, even if Nawā'ī's thesis were to be accepted as valid, he destroyed his own case by the lavish use, no doubt unknowingly, of non-Turkic words even while ridiculing the Persians for their need to borrow Turkic words. The present writer has not made a word count of Nawa'i's text, but he would estimate conservatively that at least one half the words used by Nawa'i in the essay are Arabic or Persian in origin. To support his claim of the superiority of the Turkic language, Nawa'i also employs the curious argument that most Turks also spoke Persian but only a few Persians ever achieved fluency in Turkic. It is difficult to understand why he was impressed by this phenomenon, since the most obvious explanation is that Turks found it necessary, or at least advisable, to learn Persian – it was, after all, the official state language – while Persians saw no reason to bother learning Turkic which was, in their eyes, merely the uncivilized tongue of uncivilized nomadic tribesmen. ^ The Baburnama: Memoirs of Babur, Prince and Emperor. Translated, edited and annotated by W. M. Thackston (2002). Modern Library. ^ Beatrice Forbes Manz. The Rise and Rule of Tamerlane. Cambridge University Press, 1999. pg 109: "In Temür's government, as in those of most nomad dynasties, it is impossible to find a clear distinction between civil and military affairs, or to identify the Persian bureaucracy solely civil, and the Turko-Mongolian solely with military government. It is in fact difficult to define the sphere of either side of the administration and we find Persians and Chaghatays sharing many tasks. (In discussiong the settled bureaucracy and the people who worked within it I use the word Persian in a cultural rather than ethnological sense. In almost all the territories which Temür incorporated into his realm Persian was the primary language of administration and literary culture. The language of the settled population and the chancery ("diwan") was Persian, and its scribes had to be thoroughly adept in Persian culture, whatever their ethnic origin.) Temür's Chaghatay emirs were often involved in civil and provincial administration and even in financial affairs, traditionally the province of Persian bureaucracy." ^ B. F. Manz; W. M. Thackston; D. J. Roxburgh; L. Golombek; L. Komaroff; R. E. Darley-Doran (2007). "Timurids". Encyclopaedia of Islam (Online ed.). Brill Publishers. During the Timurid period, three languages, Persian, Turkish, and Arabic were in use. The major language of the period was Persian, the native language of the Tajik (Persian) component of society and the language of learning acquired by all literate and/or urban Turks. Persian served as the language of administration, history, belles lettres, and poetry. ^ B. F. Manz; W. M. Thackston; D. J. Roxburgh; L. Golombek; L. Komaroff; R. E. Darley-Doran (2007). "Timurids". Encyclopaedia of Islam (Online ed.). Brill Publishers. As it had been prior to the Timurids and continued to be after them, Arabic was the language par excellence of science, philosophy, theology and the religious sciences. Much of the astronomical work of Ulugh Beg and his co-workers ... is in Arabic, although they also wrote in Persian. Theological works ... are generally in Arabic. ^ David J. Roxburgh. The Persian Album, 1400–1600: From Dispersal to Collection. Yale University Press, 2005. p. 130: "Persian literature, especially poetry, occupied a central in the process of assimilation of Timurid elite to the Perso-Islamicate courtly culture, and so it is not surprising to find Baysanghur commissioned a new edition of Firdawsi's Shanameh ..."
^ B. F. Manz, W. M. Thackston, D. J. Roxburgh, L. Golombek, L. Komaroff, R. E. Darley-Doran. "Timurids". In Encyclopaedia of Islam, Online Edition (2007), Brill. "As it had been prior to the Timurids and continued to be after them, Arabic was the language par excellence of science, philosophy, theology and the religious sciences. Much of the astronomical work of Ulugh Beg and his co-workers ... is in Arabic, although they also wrote in Persian. Theological works ... are generally in Arabic." ^ "Persian Paintings". Persian Paintings. Retrieved 2013-02-11. ^ "Islamic Art and Architecture". MSN Encarta. Archived from the original on 2009-11-02. Retrieved 2017-11-28. ^ "Persian art – the Safavids". Art Arena. Retrieved 2013-02-11. ^ Czechoslovak Society for Eastern Studies (1968). New Orient. p. 139. ^ John Onians, Atlas of World Art, Laurence King Publishing, 2004. p. 132. ^ Encyclopædia Britannica, "Timurid Dynasty", Online Academic Edition, 2007. "Turkic dynasty descended from the conqueror Timur (Tamerlane), renowned for its brilliant revival of artistic and intellectual life in Iran and Central Asia. ... Trading and artistic communities were brought into the capital city of Herat, where a library was founded, and the capital became the centre of a renewed and artistically brilliant Persian culture." ^ a b c John Julius Norwich, Great Architecture of the World, Da Capo Press, 2001. p. 278. Aka, Ismail (1996). "The Agricultural and Commercial Activities of the Timurids in the First Half of the 15th Century". Oriente Moderno. Istituto per l'Oriente C. A. Nallino. 15 (76/2): 9–21. JSTOR 25817400. Subtelny, Maria Eva (1988). "Centralizing Reform and Its Opponents in the Late Timurid Period". Iranian Studies. 21 (1/2): 123–51. doi:10.1080/00210868808701712. JSTOR 4310597. Wikimedia Commons has media related to Timurid dynasty.